Mike Lawrence is probably the top American bridge author. He has over 20 books in print. All are good and most are excellent. 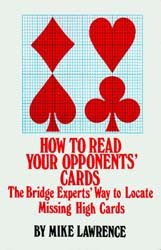 My favorite may be his first book, How To Read Your Opponents' Cards (The Bridge Experts' Way to Locate Missing High Cards). Mike was 30 when he won his first World Championship as a member of Ira Corn's Dallas Aces. When Mike was 32 and two-time defending Bermuda Bowl champion, Corn suggested he write a book. When Mike balked at the idea, Corn reminded him who wrote the checks... and How To Read was born. I would recommend this book to anyone looking to make the leap from Intermediate to Expert. Mike shows the reader lots of basic inferences available from bidding and play of normal, everyday hands. He then moves on to the technique of "discovery play", that is, forcing the opponents to show you their distribution and locations of high cards. The final chapter changes tone from the rest of the book-- it's all about reading hesitations and other tells from your opponents. I don't find this part nearly as useful as the rest of the book. Generally, when I'm playing against strong opponents (say in a Bracket I of a regional knockout), they don't show these tells, and when I'm playing against weak opponents (say at a club game) their hesitations and fumbles generally just mean they weren't paying attention. Maybe these tells were much more prevalent in the early 1970s... and just maybe my "sixth sense" doesn't work as well as it should. The rest of the book is spot-on, though. See my post on Modified Responses to Jacoby 2NT for more on this auction and for better ways to utilize your bidding space. So our hero South plays 4S on the diamond lead. East wins two diamonds, and hoping his partner's fourth-best was from Qxxx, shoots a third back. South wins, and sees a simple way to make the contract-- play up to a heart and try to hook the king of spades on his right. But like all good declarers, once he's found a good line of play he looks for a better one! He tables the jack of clubs. East, suspecting what declarer's up to, holds up for a round, but is forced to take the second club. East plays a heart to declarer's ace, and South bangs down the ace of spades, dropping the king on his left! Mirrors? No-- South recalled East's first seat pass, and watched 11 HCP tumble out of his hand. South knew that East couldn't hold the king of spades, so the only way to pick up the suit for no losers was for West's king to be stiff, and play accordingly. West held his cards much closer to his chest for the rest of the session.